GATE 2019 Last date for Application Form has been extended till 1st October 2018. GATE 2019 Examination Will be held on 2nd, 3rd, 9th and 10th February 2018. GATE 2019 will be Conducted by IIT Madras. 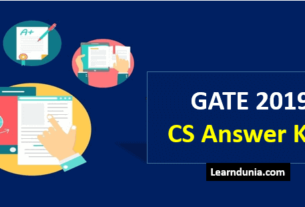 Click Here to View GATE 2019 Exam Poster. Candidates need to send their GATE application form 2019 to the conducting authority or any of the 8 zonal GATE offices. The authority give a facility to the candidates that they can choose three exam centers in the application form filling time which is familiar to them. Other two will be from the same zone. Candidates can pay gate application form fee through online mode only. The national level exam will be conducted in the online mode on February 2nd, 3rd, 9th and 10th, 2019 for admission to M.E./M.Tech/Ph.D offered in IITs/NITs/CFITs and PSUs recruitment. Every year 9 lac students appear for the GATE Exam. In 2017, 9,22,167 registered for GATE approximately. Among of them only 7,87,148 appeared and 1,29,149 are cracked the GATE . For detailed information on GATE 2019 application form dates to apply, procedure, fee payment, documents required, image specification read the complete article which is given below. Enter the required details in the form like enrollment number and password. The status of the application form will be shown. If any error exist then need to correct them from the correction window. Candidates those makes mistakes in their application form while filling has correct their particular or exam centers by logging in through GOAPS from 4th Week of October, 2018. For this candidates need to pay 400 Rs to correct it. Those who want to edit their Gender/Category/PwD from the GATE application form 2019 can correct it until October 1st, 2018. Those who want to make changes and to verify the email ID and mobile number candidates were need to log in to the GOAPS portal and then click on “Change Personal Data” link. Those who want to edit GATE 2019 application were asked to request through registered email ID to the respective zonal GATE office. While correcting details in GATE application form candidates had to send the email requesting ‘Correction in data (enter enrollment number as well the type of correction)’ given below along with the scanned copy of proof. For correcting the particulars candidates need to pay applicable fees. Final year students: Provisional Certificate Letter issued by the Head of Institute/ Dean/ Registrar/ Head of Department as per format. Graduates: Graduates can upload their Degree Certificate/ Provisional Certificate/ Course Completion Certificate. Semester students: Upload copy of the semester marks sheets depending on the programme currently pursuing. For more information read GATE Eligibility Criteria 2019. Final year of AMIE – Upload a certificate from the Head of the Department/Institute in the format given or a copy of mark sheet with signature and seal. Important Note: Marks sheet downloaded from the Internet shall not be accpeted. 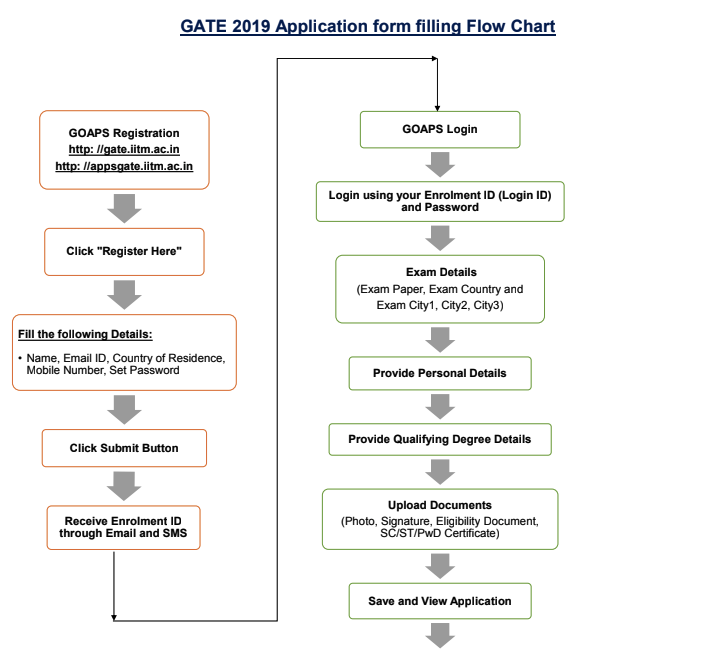 How to fill GATE 2019 Application Form? Candidates can fill their application form via online mode only. Candidates needs to follow given process for processing their application form. Those who check and find they are eligible for GATE Registration need to apply for GATE 2019. For registration, candidates should have entered valid email ID, mobile number and create a GOAPS password. Once candidates received all the registration details on their registered email ID can login in GOAPS dashboard. GOAPS Enrollment ID – Those who registered for GATE 2019 will get GOAPS Enrollment ID for future login. These are involved in the third steps of GATE Application form where you need to upload scanned photographs like passport size photograph and scanned signature . Below are the guidelines for uploading photographs and signature. Background Background must be white or a very light color. Face of the candidate Candidates face should be infront of camera and should be cleared and visible. Dimension Maximum image size of signature: 160×560 pixels.Minimum image size of signature: 80×280 pixels. Size Draw a rectangular box of size 2 cm × 7 cm (Height x Width) in the A4 white paper. Clarity Sign with black ink pen within this box. Once you have completed the first three process then you need to check your application form or review it whether you fill all details in the correct format or not. Once candidates check their application or review it and find that their all details are in correct form then need to pay application fee which are given below according to the category. For international candidates the conducting authority gives a facility for making payment in US currency and can pay their application fee in Dollar. Once you going to enter in final submit, it is advised to the candidates that please ensure that the details you entered in the application should be correct format. Once you confirm and sure that the details you fill in the application form are in correct then click on Final Submit Button. What if you lose/forgot GATE 2019 Enrollment ID or Password? Forgot enrollment id or not received their enrollment id via email – For this candidates need to select forget enrollment id option and then need to fill their registered email id or registered by mobile number by which they can retrieve their enrollment number. The enrollment id will be sent to your registered mobile number via SMS or via email which is registered. Forgot Password – Candidates can retrieve their password by entering below given details in the form which is occurred clicking in the Forget password button. Forgot both Enrollment ID and Password –In this case, the candidate who has paid the fees must contact their respective zonal office. If the candidate has not paid then they will have to register themselves.